First off, let me start by saying we are on vacation! YES! We were all ready for a break from the craziness of life, and were so excited about our yearly trip to California and Disneyland. Unfortunately we've had a pretty bad experience, and for the sake of families that come after us, I feel like we need to share. Things like this shouldn't happen, period. Finding a hotel was interesting. 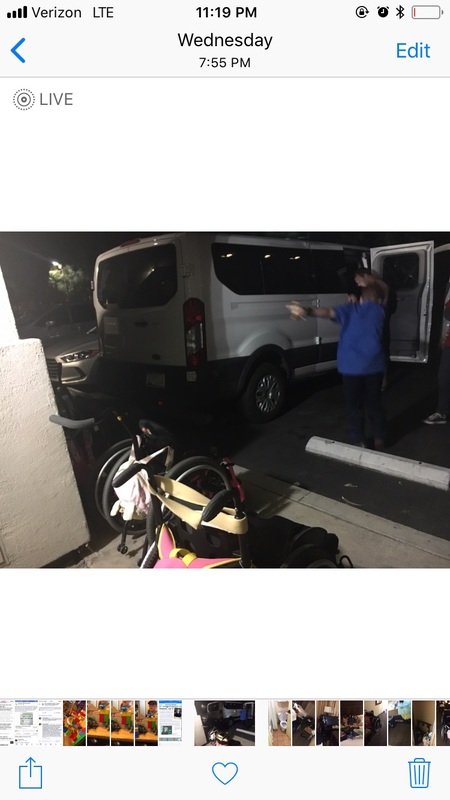 We had a close family friend joining us, and finding a hotel room to accommodate 7, that was also within walking distance of Disneyland, was quite the feat. I was SO excited to find a 2 bedroom, 2 bathroom suite with a living room area and pull-out couch at the Holiday Inn and Suites in Anaheim, half a mile from Disneyland. With our "extra" potty stuff with the girls, and having an extra adult, I knew one bathroom wouldn't be enough, and we also needed a room with enough beds to fit our family, plus our friend who needed her own space. It was out of our price range, but perfect for our situation, so we decided to splurge and get what would meet our needs. Wednesday morning we left for California. When we finally went to check in, after driving 8 hours to get there, we realized there was NO ELEVATOR to our section of rooms, and we were on the second floor. There were elevators to every other part of the hotel, except for to ours, even though the website clearly stated there were elevators, and gave no exceptions to this fact, even when booking the room. Now, let me just say, I did not reserve an accessible room, because it was not needed. Based on the photos of our room and the website description, an accessible room wasn't necessary. I still lift the girls on and off of the potty anyhow, and the room had a shower that the girls could scoot right in, so no additional accessibility was needed for us. All that we needed to be able to do was to get up to our room. The website clearly stated they had elevators and were accessible, and DID NOT state anywhere that these particular rooms were not accessible by elevator, so I honestly thought things would be smooth and we would have no issues. After spending some time getting out the girl's wheelchairs and looking for an elevator, we called the front desk confused. That's when we were told that section had no elevator. The front desk manager was apologetic and felt really bad. She spent some time trying to find us an alternative room. At first, she offered us a one bedroom room with two queen beds and one bathroom (aka one standard room). I informed her that we would not be able to fit in a room like that, and additionally, because we had 3 adults and 4 kids, it would be a fire hazard. Next she offered to put us in two separate standard rooms with a conjoining door. She said that we would only pay for one room, and then they would switch us to a two-bedroom suite on Friday when they were able. I told her that we would be at Disneyland, but they offered to move our luggage, so we agreed to that arrangement. She was apologetic and tried to help. They helped us get our luggage settled in the alternative rooms, which ended up being down the hall from each other, not conjoining. It was late by that point (almost 9pm), this whole ordeal had taken almost an hour to fix, the kids were tired and hungry, Conner was crying because he had to be down the hall with our friend and not right next to us (I needed the girls with me due to potty issues, and it wouldn't have been appropriate for David to stay with our friend. Conner loves her and feels comfortable with her, she's like family to us, but he was expecting to be in a connecting room), so even though the situation was frustrating, we were glad to finally be settled and be able to feed the kiddos and put away our things so we could go to Disneyland the next morning. On Friday, they moved our rooms for us, and we were SO thankful to finally be in the right room and have enough room. The other rooms were cramped, not designed well for our girls, the bathroom was so tiny the door hit the toilet when we opened it, there were bugs, and overall, it wasn't the best experience. On Sunday, we went to check out. We were shocked by our bill. Yes, we were charged for one room, but they charged us for the two bedroom suite the ENTIRE TIME, even though we couldn't stay in it Wednesday night or Thursday night because there was no elevator access. David talked to the front desk manager, and she told him that she had no power to adjust rates, even though she is the one who originally told us we would only pay for one room, and that we would need to talk to the assistant general manager. I went back, upset, telling her that this is NOT what we agreed to, and that it was not our fault there were no elevators. If there were going to be no elevators, they needed to CLEARLY state that on their website, which of course they did not. Had they disclosed that fact, or if they had elevators to each section of the hotel, like it sounded like they did, we would not have had an issue to begin with. I was upset (I was raising my voice at this point, which I feel bad about, but it was just the icing on the cake for me. We work SO hard at advocating every single day, and sometimes, the fight gets the best of me and I just want a chance to relax. I just want to be able to book a hotel, stay in it, and not have to fight. Not to mention I was exhausted from cramming a bunch of therapy and doctor's appointments in before the trip, had multiple late nights prepping, multiple consuming phone calls that had to be made before we left, bills that had to be paid, a seizure/ambulance ride/ER visit we had a week before the trip for Madi, packing all the regular stuff, in addition to all the meds, oxygen, urinary supplies, etc..., and everything else that goes in to being able to take my family on vacation (don't worry... it's all worth it)), but was told, again, that we needed to talk to the general manager. After leaving I was still upset at how the situation was handled, and how we were completely misled when they said we would only pay for one room. We thought the room we would be paying for would be the one we actually stayed in, which was at least $200 less a night. According to them, however, they appropriately accommodated us by moving us, and "did us a favor" by only charging us for the suite, since according to them it was our fault for not calling in advance to notify them that we would need an elevator. Wow. Even though they gave us two rooms it was still not comparable, because it lacked the extra living room area that the suite had, and the extra large bathroom we needed for our girls. After this, I called and filed a complaint with guest relations. I was told this should not have happened and that they would get back to me by the next day. Today I still hadn't heard from them, so I called and talked to the assistant manager at the hotel. She was so terrible to deal with. Mean, uncaring, and just plain harsh. First she said that they took the suite price and split in in to two rooms. The problem with that, though, is two rooms is STILL cheaper than the price of the suite. Then she said they only charged us for one room and comped the other one. I said that charging us for the suite as the room for two nights when we didn't stay in it was not ok. The suite is far more expensive than a standard room. The assistant general manager said it was my fault because they are ADA compliant and I should have told them I needed an elevator. I told her that their website stated there were elevators, and NO WHERE did it state that the suites did not have elevator access, but she didn't care. She also tried to tell me we checked in at 5pm, and I informed her that she was completely wrong. I called at 5:50 to let them know we would be checking in late. I have proof on my phone. When I told her, she just sat silently. She tried to tell me that David originally agreed and that we had no problems until the day we checked out. Of course he did. He agreed to have a room comped for us, but they never ever informed us that they were still charging the suite rate for that one room, even though we couldn't stay there half the time. Of course we didn't complain, because we didn't see the bill until we checked out. How could we know?? This whole situation is just so wrong. I had my husband call back and she was just as rude and harsh to him. He told her that we were told a room would be comped and we would only pay for one room those first two nights, and she told him we were (because they charged for only one room..... the expensive suite we weren't in), and that she would not be adjusting the price. After that he said we would keep moving up the line, and even contact media if we needed to, because this is just wrong. She told him he didn't need to threaten her. As if David has EVER threatened anyone in his entire life. But the fact of the matter is, the way this is handled was not ok. Here's my phone records. The first call was informing them we would be checking in late. The second was calling because we couldn't find accessible parking by our rooms and I needed to let them know I would have to double park, and the third was while I was talking to the desk manager, trying to work things out. And here's my photo of us attempting to unload and not being able to find the elevator. You can see that it's dark, and the time on my camera, so it was clearly not 5pm. Though, honestly, I'm not sure why that matters or why she attempted to argue that point with me. It doesn't put an elevator in their hotel, or fix the situation. Though the guest relations personal told me that there was no decision yet, the assistant general manager told David that they knew I had posted on facebook about the issue (I posted on my personal page), that they were watching social media and knew everything, and that she had already talked to corporate and they were in agreement. I really hope that's not the case. I really pray they don't actually find this acceptable. The issue is, even if we were billed as they stated we would be, there is still a major problem here. They should have to disclose that those rooms have no elevator access. It should be very clearly marked. They should not be able to state they have elevators, without stating that part of their hotel does not. The assistant general manager should not be harsh and rude to her customers. At this point, they can't fix how upsetting this has all been. They can't fix that this had made our trip unnecessarily stressful. They can't fix the anxiety they have put us through, or the hour we were waiting to get in a room, or the fact that my kids were starving and left waiting (I fed them snacks, of course, but we had planned on eating at the hotel restaurant with them, and by the time we got in our room, the restaurant was closed). They can't fix the inconvenience, or the bugs, or the ongoing issue this has become. What they can do, though, is make right with what they offered us. Most importantly, though, they can fix their website wording and description so this NEVER happens to another family again. Life will go on for us. We will still have a fun trip. We will never return to Holiday Inn, but we won't let it ruin our time away with our kids. I pray, though, that this never ruins any other family's trip. 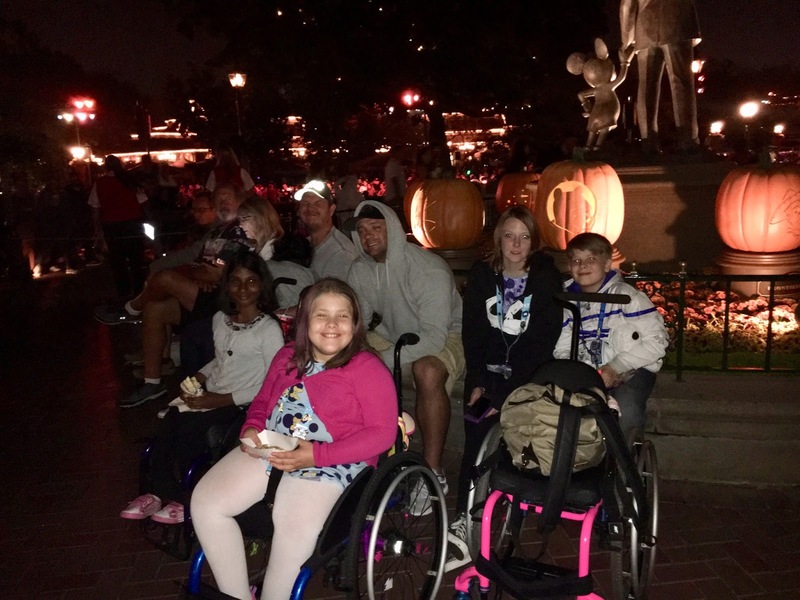 Just because our girls use wheelchairs, doesn't mean we don't deserve the same accommodations as every other family, and the ability to chose which rooms work best for us. We just need those rooms to have an elevator. In this day and age, that shouldn't be asking too much. I would file a complaint with the ADA against them. Health and building code with the city. And call your Credit card company to see if they can protect you against these charges that you should not have been charged/ and a good lawyer. Report them to BBB,(Better Business Bueru)also. I would probably also be annoyed and frustrated with them too. This reminds me of a family trip to our local bowling alley one night a few months ago. I was pregnant with my third child and I politely asked them beforehand for mobility support to get our disabled child up the steps so we could enjoy a normal family activity. I was told that we could use the lift. When we get there I find out that we can not not even use the lift because it was out of order. So we ended up having to take the twins up the stairs in the most undignified way imaginable. No support whatsoever. Then when we eventually got up there I headed to the front desk to ask why their lift was broken. They could not offer any reasonable explanation or apology either. Not impressed with this place. To add insult to injury we were forced to have only one lane despite the fact that I had requested two lanes so that our son could have a go with his father while me and my daughter played our game. My child with special needs is never the issue. Judgmental people are. The morning after I wrote a disparaging email to them. They do not even have a money saving scheme for customers either. That pisses me too.